Like exclusive slots? 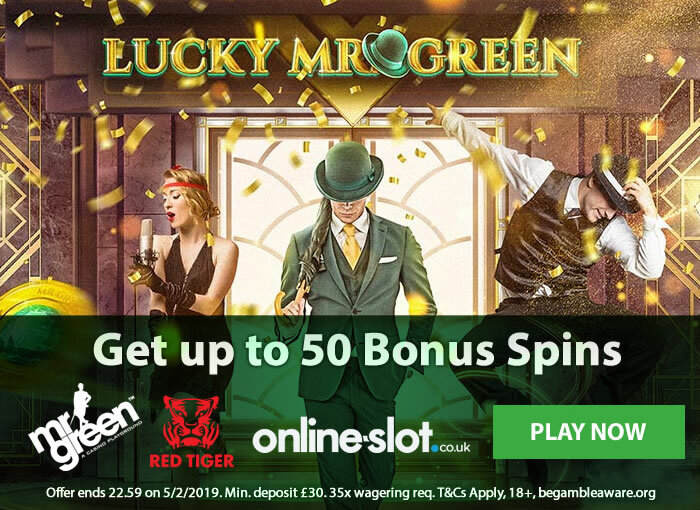 Well, Mr Green Casino is the only place to play Lucky Mr Green – they are offering you up to 50 bonus spins to play it. The promotion is only available today though! You need to opt in to the promotion (done once you’ve logged in to your Mr Green Casino account) and then and deposit and play £30 or more. You will get 1 bonus spin for every £2 you deposit. If you were to deposit and play £100, you’d get the maximum 50 bonus spins available – it’s that simple. The bonus spins will be valid for 7 days after release and winnings will come with 35 times wagering requirements. They will only be valid on Lucky Mr Green – an exclusively-produced slot from Red Tiger Gaming. Lucky Mr Green is a 5 reel, 20 payline slot which has a jazz theme – playable from 20p a spin on all devices, it has a 1930s, art deco feel and looks rather good. Look out for Mr Green himself randomly making an appearance and he will reward you with 1 of 4 extras. You can benefit from low value royals being removed from the reels, see a 3×3 mega wild added, fans that transform into wilds and multipliers up to 20x. There’s also a Free Spins feature where all the random features can apply. The best is the Showtime Bonus feature where you go on a cash trail to win up to 800 times your stake. For more details, and to play for free, check out the Lucky Mr Green slot review. Not played at Mr Green Casino? As well as having all the latest and best slots, they have great customer service, fast cashouts and continuous promotions – there are lots right now focused on the Chinese New Year. Sign up to get 20 exclusive Starburst no deposit bonus spins, a 100% bonus up to £100 plus 200 more bonus spins.